The System Tray Icon example shows how to add an icon with a menu and popup messages to a desktop environment's system tray. The editor allows the user to choose the preferred icon as well as set the balloon message's type and duration. The user can also edit the message's title and body. Finally, the editor provide a checkbox controlling whether the icon is actually shown in the system tray, or not. When the showMessage() slot is triggered, we first retrieve the message icon depending on the currently chosen message type. 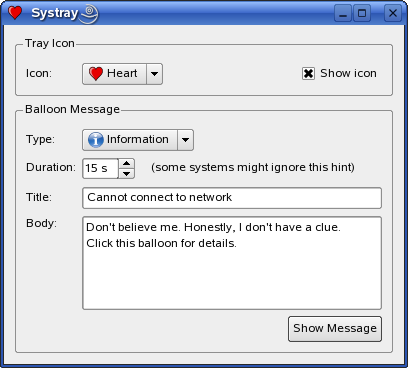 The QSystemTrayIcon::MessageIcon enum describes the icon that is shown when a balloon message is displayed. Then we call QSystemTrayIcon's showMessage() function that shows the provided message with the given title, body and icon for the time specified in milliseconds. QSystemTrayIcon also has a corresponding signal, messageClicked(), that is emitted when a message (displayed using showMessage()) is clicked by the user. We have reimplemented the QWidget::closeEvent() event handler to receive widget close events, showing the above message to the users when they are closing the editor window.